You would’ve been hard pushed to get a table at any of the decent joints in Newcastle this last couple of weeks. Everywhere in town was full to bursting of people trying something new, tucking into a good meal after work, happily instagramming their meals and generally having A Nice Time. That’s because starting January 27th it was the official NE1 Restaurant Week in Newcastle. For the whole week some of the best restaurants in NCL offered their bestest dishes, and in some cases a whole special menu, for a set price of either £10 for two courses or £15 for three. Some places went a bit rogue and made up their own variations on the prices but on the whole, right now, it’s kind of a good time to be in the North East. NE1 Restaurant Week is a biannual thing, the other one being in August. Pretty perfect because in January/February you really need a kick up the arse/an excuse to put layers upon layers of clothes on and go out for dinner, and in August you actually want to be out and about, with fairer weather (in theory) and lighter nights, so you’ll find that having a list of extra places to go (and food to eat!) is a treat by all accounts. The best of both worlds. Good planning team, good planning. As You Like It, Barluga, Babucho, Blackfriars, Brasserie at John Lewis, The Broad Chare, Browns, Cafe 21, Cafe 21 at Fenwick, Cafe Rouge, Cafe Vivo, Coast to Coast, The County Hotel, Dabbawal, Dacantus, Electric East, El Coto, El Torero, Fujiyama, Fat Buddha, Garden Kitchen, Gusto, The Herb Garden, Hei Hei, Hotel du Vin, Johanns, Las Iguanas, La Tasca, La Vina, Mamak Corner, Mannaza Korean Grill House, Malmaison, Marco Pierre White Steakhouse and Grill, Marco Polo, Nectar, No28, Northside Diner, Oak, Osaka, Pan Haggerty, Paradiso, Pitcher & Piano, Popolos, Prima Ristorante, Piccolino, Quay 7 at The Copthorne, Rasoi, The Salsa Cafe, The Silk Room, St Sushi, Sabatini Ristorante, Sacchins, Tiger Tiger, Tivoli at Fenwick, The Bridge Tavern, The Living Room, The Lock and Key, The Sausage Emporium, The Stand, The Town Wall, The Vermont Hotel, Vujon, The Waterline, UNOs. Gawwwwwwwwd. That list was far longer than I expected when I first started writing it. I started to wish I’d never started doing it by the Ds and Es. But there you go, you lucky muffins. The compressive list. I don’t think I’ve left anyone off. I won’t bore you with any further drivel about each and every venue featured on that, the mightiest of lists, but basically my personal highlights (incase you didn’t manage to read it to the end) are The Broad Chare, Cafe 21, Cafe Vivo, Dabbawall, Electric East, Hotel du Vin, Pan Haggerty, The Bridge Tavern and The Stand. Those are the ones that are generally my favourite eateries around the city anyway so with any kind of special offer it seems like a no-brainer. This year Mr SB put his foot down and (very generously, I suppose) said I could pick three places to hit up over the course of the week and he’d pay. Sweet. I finally whittled it down to Pan Haggarty on Monday, Dacantus on Wednesday and finally The Hotel du Vin on Thursday. Pan Hag was a treat as always. Good British classic tastes served with a confident flourish so at £15 for three courses it’s a total steal. Dacantus was a new one for me and, if I’m being completely honest, I don’t have a great deal to say about the food. It wasn’t anything special. The gin menu was certainly worth a revisit though. I had an amazing (massive) goblet of Sipsmith gin, tonic, lemon and vanilla. Finishing the week at The Hotel du Vin was an excellent plan. I love the venue, the menu, the food and the staff. It was possibly the best meal of the week. Certainly stiff competition for Pan Haggerty. The snaps below don’t really do the dishes justice but feast your eyes anyway. If you like what you’re reading and seeing then keep your eyes peeled over on twitter come August for the next NE1 Restaurant Week and book your tables fast before they fill up! Black pudding beignets with crispy bacon, apple ketchup and a celery salad. Braised ox cheek with a heritage potato salad, pickles ad baby gem. Confit chicken leg with creamed mashed potato, peas and pancetta. Mince and homemade thyme dumplings with an ale gravy and braised red cabbage. Apple and berry crumble with vanilla custard. Home-made pate served with toasted bread. Calamares, squids in a white wine garlic sauce. Wok-style chicken with soy sauce and crunchy vegetables. Pudding made with egg yolk & syrup with pineapple. Tartiflette, sautéed potato, pancetta lardons, white and garlic cream, Reblochon cheese. Pork and pistachio terrine, cornichons, sour dough bread. 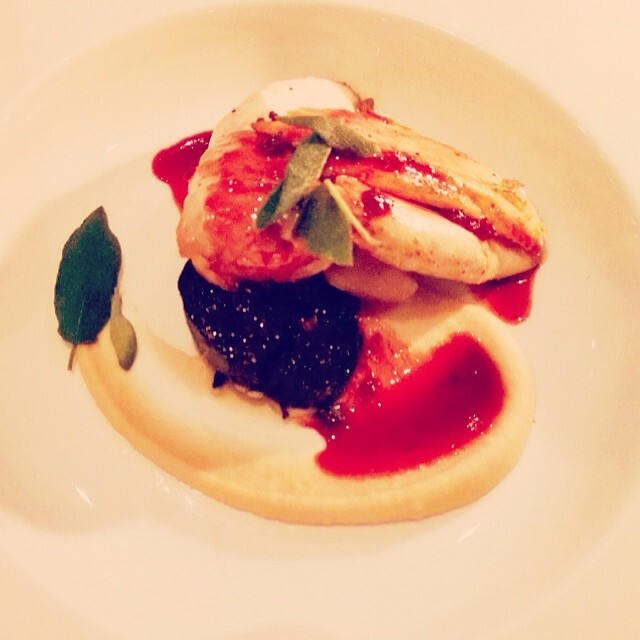 Pan roasted Northumberland chicken breast, butterbean purée, bury black pudding, sage and beetroot jus. Corned beef hash, slow cooked brisket, parmentier potatoes in a rich Wylam ale jus topped with a fried duck egg. Sticky toffee pudding, salted caramel sauce and peanut butter ice cream. Banana bread and butter pudding, rum and raisin ice cream (which I substituted for the peanut butter ice cream instead).